Stay up to date on all town meetings by checking the archive of meeting agenda, notes and results. Browse a listing of upcoming community events including town meetings, rental reservations, and voting dates. 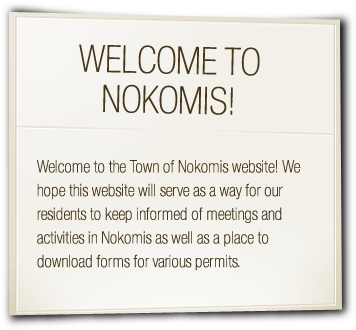 Access voter applications, ballots, rental forms and license documentation for the Town of Nokomis. The Town Hall and offices are located at 2541 Lake Nokomis Road. Hours of the Town Clerk are currently Tuesdays and Thursdays from 4:30 to 7:00pm and the second and last Saturdays of the month from 8:00am to 10:00am (excluding holidays). Town Clerk Wendy Smith 715-612-4103 may be contacted to arrange for an appointment outside of those hours. The Town Board meets the second Monday of every month. Notice of meetings and agendas are posted at Schaefer’s Wharf, The Landing, and at the Town Hall. WEIGHT LIMIT PERMITS: Weight limit permits will not be issued for furniture delivery. NOKOMIS 60TH ANNIVERSARY BOOKS: A written history of the Town of Nokomis began in 1988, to celebrate the 40th anniversary of the town. A revised edition to continue the history for the 60th anniversary was written by Margaret Beals (Town of Nokomis Historian). Brief histories of events of the town leading to 2008 are included with personal stories of residents and business owners. This book is available at the clerk’s office for $20 a book. Copyright (c) 2019 Town of Nokomis. (715) 453-4801 2541 Lake Nokomis Road, Tomahawk, WI 54487 . All rights reserved.